Fresh, crisp air and cooler temps signal peak harvest time for some of our favorite fall produce. Multicolored pears hang heavy and low from clustered branches. The burgundy skins of new potatoes peek from rows of rich soil. Produce that’s harvested during peak season is most flavorful and fresh because it travels a shorter distance to reach your local grocery store or farmers market. For similar reasons, it can also be more affordable and leave a smaller carbon footprint. So to help you savor all of these delectable perks, we created this fall produce guide. It describes what’s in season during September, October and November (exact peak times vary depending on your location), provides some interesting facts about these fruits and veggies, and offers up some tasty recipe ideas. This bell-shaped vegetable thrives in warm weather. So as you might imagine, it flourishes in the summer and is ready for harvest by the time the trees start to change colors in the fall. They’re rich in all sorts of vitamins and minerals, especially potassium. In fact, one cup of cubed butternut squash has more potassium than your average banana! Selection: Look for squash that are a dark shade of beige with a matte appearance. Avoid squash with shiny skin. Pick ones that still have the stem; they’ll stay fresh longer. Ripe squash will sound hollow when you knock on them. Storage: Keep whole, unpeeled butternut squash in a cool, dark place. Basements and closets are great spots. Peeled squash, on the other hand, should be wrapped tightly and refrigerated. Butternut squash is naturally sweet, so it pairs well with other sweet, cozy fall foods and spices like cranberries and cinnamon. It also works well with savory ingredients on the other end of the flavor spectrum, like our smoked cracked pepper ham and Swiss cheese. All of these ingredients (and more!) 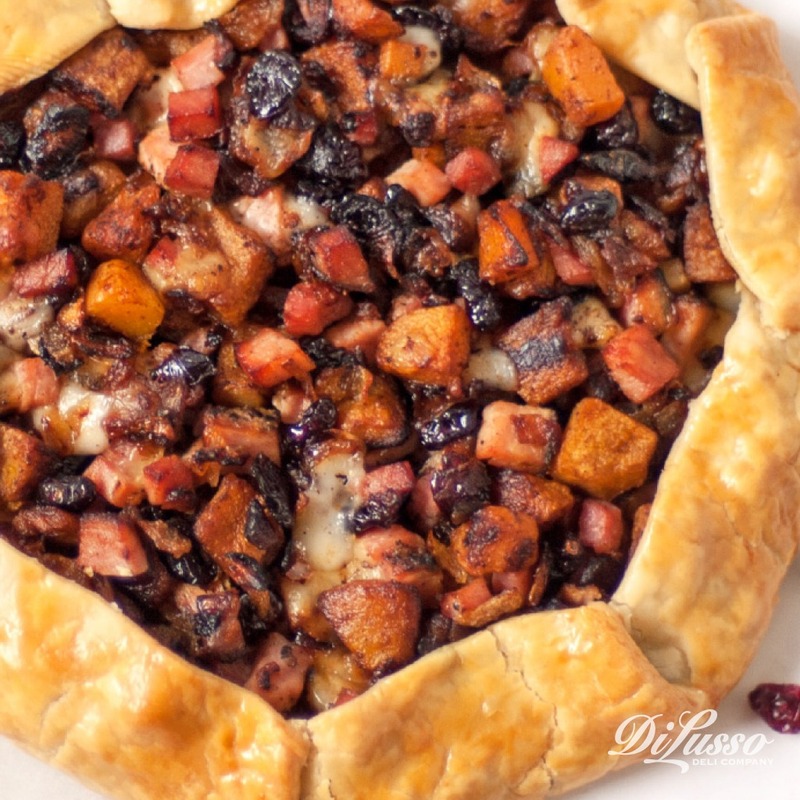 come together in this Autumn Galette. Each bite is like a taste of fall. This hardy veggie has a long harvest season. It usually starts in early September and can go all the way through January depending on the climate in which they’re grown. The key is to harvest the small emerald globes before the first frost, which often comes later in warmer climates. Selection: Ripe sprouts will look like tight, well-formed green balls. They should be about the size of a golf ball. Steer clear of sprouts that have yellowed leaves or little holes because these could be signs that pests have made those sprouts their home. Storage: Only wash right before you plan to use to help prevent molding. In the meantime, they can chill in the fridge in an unsealed bag. You name a method and the versatile Brussels sprout can probably be cooked that way – pan-fried, deep-fried, grilled, boiled, steamed — the list goes on. Yet oven-roasted is our technique of choice. It strikes a nice balance between crispy on the outside and delicate on the inside. 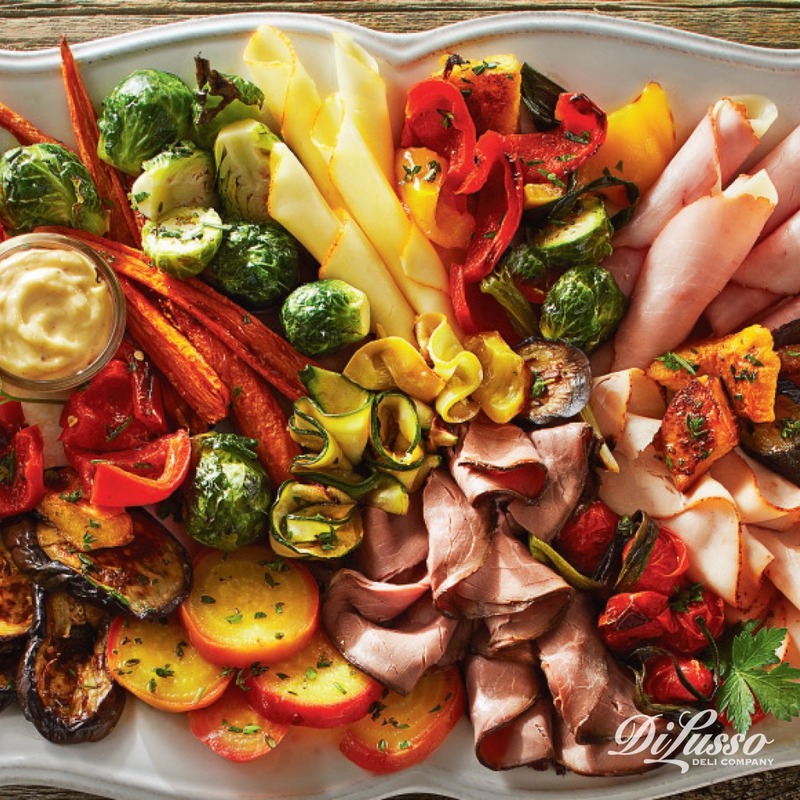 Plus, it roasts well with other veggies, like those in this Fall Platter — carrots, squash, bell peppers and beets. A somewhat delicate fruit, pears grow best in warm weather. So they’re typically cultivated during spring and summer, and then harvested in the fall. With more than 3,000 varieties grown around the world, pears are surprisingly diverse. They come in all shapes (round to oblong), sizes (5–15 cm long) and colors (light green to dark amber). Selection: The best way to check for ripeness is to do what’s called the “neck check.” With your thumb, press gently near the stem. If it gives in to the pressure, it’s ready to eat! If the body of the pear feels soft when you squeeze gently, it’s likely too ripe and will be overly juicy. Storage: Pears ripen best at room temperature. So leave them on your kitchen counter when you have unripe pears on your hands. If you want them to ripen quicker, place in a brown paper bag. For pears at just the right ripeness, store in the fridge. 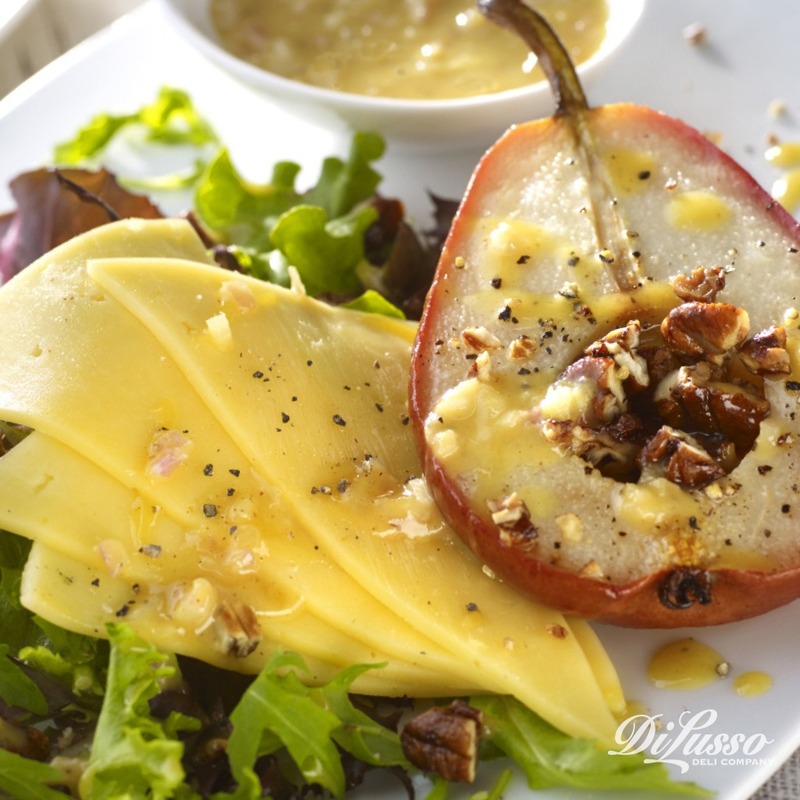 The natural sweetness of ripe pears provides a nice contrast to disparate flavors, like those in our Roasted Pear Salad – tangy vinaigrette, our smoked gouda, robust black pepper and earthy baby greens. As it roasts in the oven, the pear’s honeyed juices flow from its supple core, sharing its sweet nectar with these ingredients to create a warm and flavorful salad. It’s the perfect complement to a balmy fall afternoon. Broccoli loves the sun, but doesn’t do so well in the heat. That’s why it’s often planted near the end of summer. This way it can soak up the rays without being exposed to the hot midsummer months. Broccoli also loves to soak up nutrients from the soil. Lucky for us, these nutrients, like vitamin A and C, get passed on to us when we eat it. Selection: Ripe broccoli will be a shade of dark green on the top (called the crown or flowery head) and a lighter shade of green on the stalk. The crown and stalk should feel firm. If it’s pale or has yellow spots, it’s past its prime. Storage: Place in a large plastic bag and keep in the fridge. Being a hardy vegetable, it freezes well too. Just make sure the broccoli is dry and the container is as airtight as possible before freezing. Ripe broccoli is great at absorbing flavors when cooked at high temps, which makes it great for sautéing in our Warm Roast Beef Bowl. 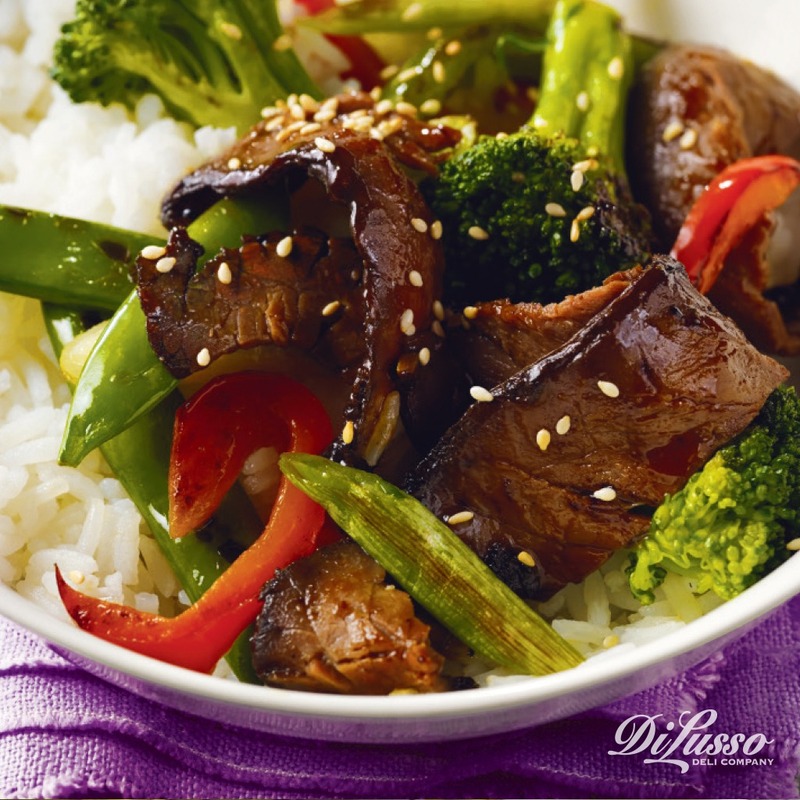 The hot oil tenderizes the broccoli so it can soak up the sweet yet savory notes of sesame-ginger sauce, the snappy bite of white onions, and the lemon and garlic undertones of our London broil roast beef. Just the thing to cozy up to on a cool fall night. Known for their small, orb-like shape and beautiful burgundy skin, late-season new potatoes are highly susceptible to hard frost. To avoid those dangerous drops in temperature, they’re usually planted in late summer and harvested in early fall. Selection: Look for potatoes that are firm and have taut skin with few blemishes (bruises, cuts or sprouts). Before making your final picks, take a quick sniff. Sometimes potatoes that look fine on the outside have started to rot on the inside. Good potatoes smell earthy and starchy while rotten potatoes have a bitter, moldy scent. Storage: Keep in a cool, dry, dark place. To extend shelf life, place in a perforated plastic or paper bag. Don’t wash before storing to help prevent mold. Fresh new potatoes are naturally very firm. One of the best ways to make them creamier and softer is to roast them with olive oil. 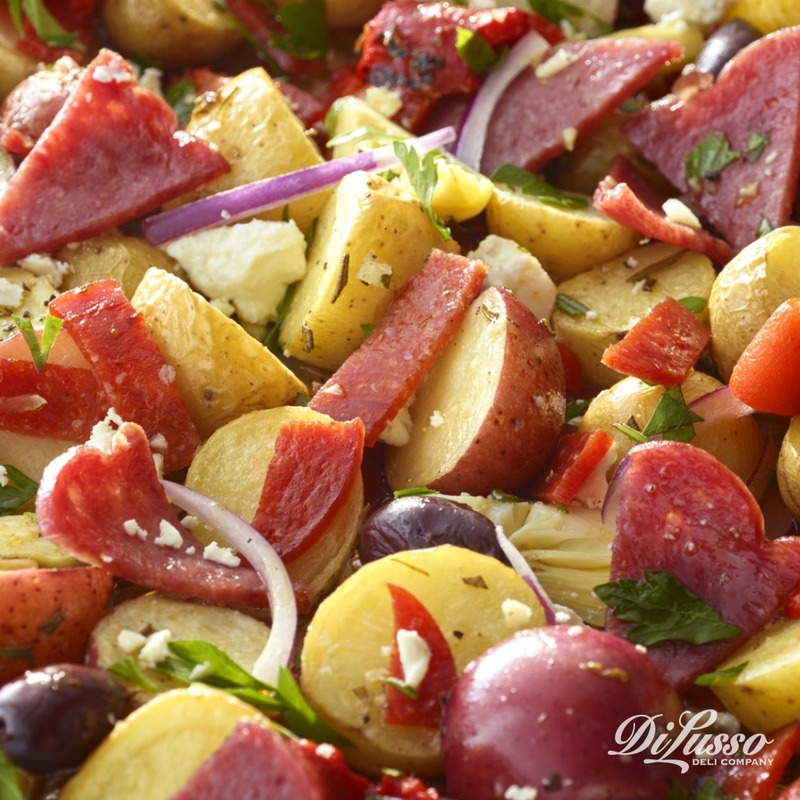 Take our Warm Mediterranean Potato Salad for example. Roasted with fresh rosemary, the new potatoes absorb the flavors of the zesty dressing, our spiced hard salami and pepperoni, piquant red onions and roasted red peppers. And to top it all off - feta cheese crumbles. Chicken, Havarti & Apple Butter Sandwich on a sourdough baguette. Harvest Salad with cranberries, apples, pears, toasted pecans and strips of our oven roasted chicken breast on a bed of baby greens. Ham, Goat Cheese & Cranberry Pastries sprinkled with pistachio nuts. Holiday Havarti Cranberry Toasts topped with orange zest and walnuts. Wild Rice Pilaf with cherries, squash and our crispy prosciutto.